Sitting dockside waiting to be boarded, this bowrider looks really impressive. The SL in the name designates “sport luxury” and the title fits the look. The black and white hull is set off with a bright red boot stripe that continues right around the generous-sized swim platform. The interior is colour-matched. A substantial stainless handrail above the windshield matches a stainless steel tower, and both are a brilliant contrast against the black hull. The whole impression is quite bold, and I personally liked the look. Next is the size, as you don’t see to many bowriders 26 feet, long and none I’ve seen have seating for 14 people. 14 that is, as long as their combined weight is under 2300 lbs. I don’t have 14 friends, so I’d have to invite my whole family along to fill it! Seating forward can be converted to a couple of variations for number of seats or comfortable sunbathing, whatever your desire. 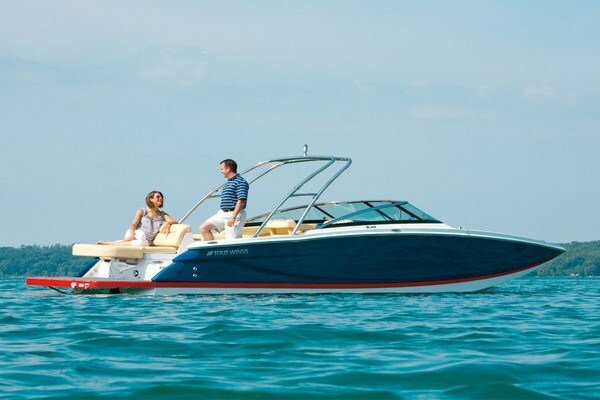 The adjustable helm and forward passenger are very comfortable bucket-type seats and all appear to be custom designed for this boat and not cookie cutter add-ons or bolt-ins. A small circular lounge portside is offset by a big L-shaped arrangement, starboard. At the transom is a rear-facing seat easily large enough for two with another single jump seat beside it. There is also a small wet bar sink and room for cooler storage under the rear seat. Before setting out on a test ride we checked under the engine hatch. This boat was equipped with Mercruiser’s newest for 2010, big-block 8.2 litre 502 engine producing 380 HP or 430 HP in the H.O. model powering this one. 430 HP, and it will still run on 87-octane fuel. Reverting to my mechanical background, I was impressed by the clean, uncluttered look, and the easy access to service points. One feature, a compressed air fitting easily clears all seawater coolant from the system, a great benefit for the servicing technician and for the environment. The 262 is also available with Volvo Penta power. We folded up the adjustable bolster helm seat for stand-up operation and set off. This is a great feature. The big Merc fired up and as all injected engines do, idled away without a fuss. By the time we cleared the harbour it was warmed up and ready to go. As one might expect with this much power at hand, acceleration is brisk. It cruises effortlessly at 30 MPH and top speed is just shy of 50 MPH. For a bowrider, the 262 has a lot of freeboard and there’s not much chance of spraying down the occupants in any normal operation. It was a cold, windy day, but the protected water in Biscayne Bay were we were testing was relatively calm so we went looking for some cruiser wakes and found some veerrry large ones to test the ride and handling. The moderate V hull handled the wakes with ease and the hull tracked arrow straight through it all. The ride is solid and quiet. If a big bowrider is in your future or on your shopping list, this one should be included on your shortlist for sure.